A leathery accord defines this heady scent, tempered in the first instance by the fresh green notes of artemisia, bergamot, clover and thyme. The heart develops into a rich blend of patchouli, sage, orris root and cardamom - spicy, warm and extremely inviting. The iconic fragrance is rounded off with a sensual base of sandalwood, amber, vetiver and musk; refined and woody, this scent leaves a magnificent and distinctive trail. 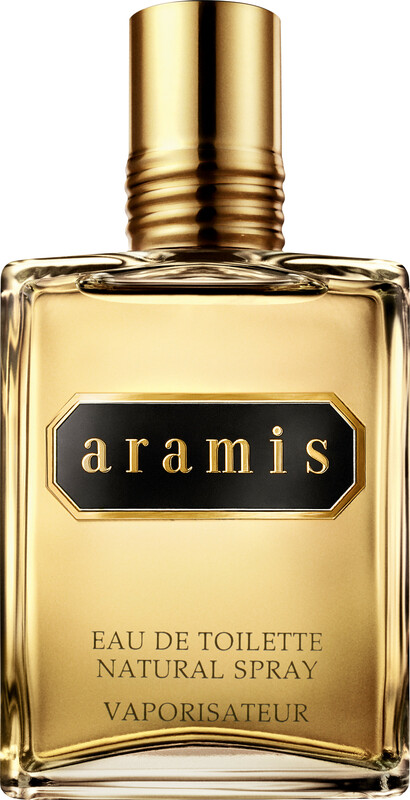 Aramis Eau de Toilette Spray is rated 4.8 out of 5 by 5. Rated 5 out of 5 by essoman from Aramis “Good Old Faithful” This is a nice masculine smell, I would say it’s like a strong musk scented wood, and the fragrance lasts a good 12 hours or more! I used this when I was in my teens years ago and then over time stoped using it, and now I’m 68; and have started using it again, its nice to have it back; it brings back old memories. Unfortunately it does not bring back the youth! Rated 4 out of 5 by ironman from Old School Giant! Old time classic still going strong. A mature fragrance with a heavy dose of leather and patchouli. Very different to the scents of today. This will still have admirers, and rightly so. Strong and masculine. Rated 5 out of 5 by ruum from Simply a classic If I'm not mistaken, it's this fragrance that I was given in a small bottle (maybe 4ml?) in a splash. I used to take whiffs of it and kept it in a small children's bag. Nonetheless, I'm not quite sure what happened to that bag now, but during my teens I used the aftershave of this and it was way too strong. But I rediscovered the EdT in 2006 and have since started taking a liking to this old classic. There is a reason why this has remained on the perfume shelves ever since. It just smells so refined and classy, it's hard to resist the masculine aroma from it. Yes, it's a heavy scent, but that just means you need to apply less and maybe go easy on it in the heat. It's an aromatic woody/spicy scent and has leather, patchouli and possibly a bit of amber in there. It's a lot sweeter than I remember but still quite divine nonetheless. It's up there with all the other classic - Tabac Original, Old Spice, Givenchy Gentleman and Puig's Quorum. No fragrance head should be without a bottle! Rated 5 out of 5 by robinw from this was a great product supplied by a great company. I would recommend using both to all my friends.